bright colors and yes, acorns! 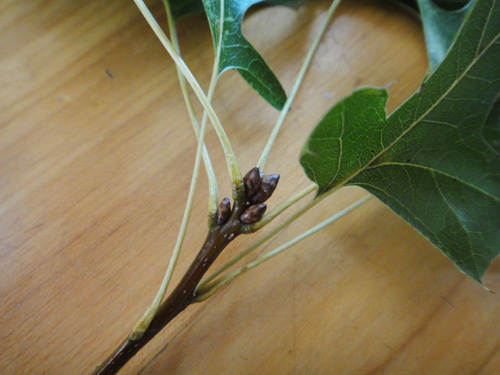 Welcome to the party, oak trees! See that there? 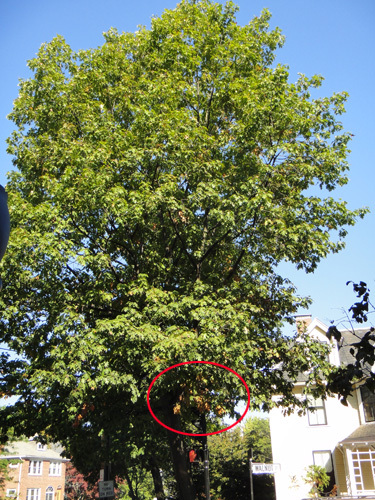 It's orangey leaves on the big oak down the street. Woohoo! 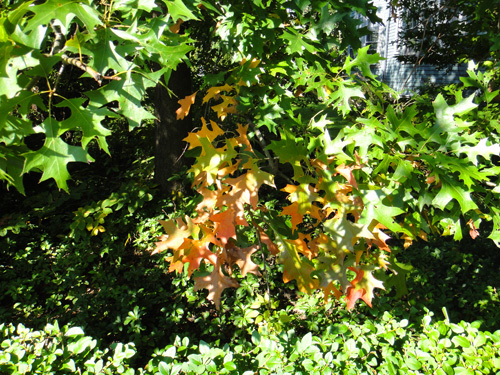 And a few yards farther down, I spotted another oak with a little cluster of beautifully colored leaves. 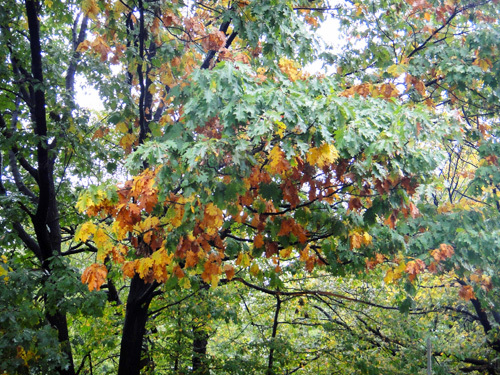 The oaks may be late, but they are making up for it with some lovely colors! I spotted these as I was stopped at a red light this week. But where are the acorns? I want to see acorns! Okay, I've seen acorns. Just not on a tree. I've never been able to find them growing on an oak. Where do they keep the things? 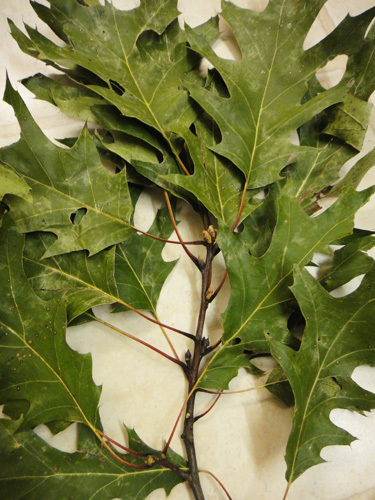 I happened to find an oak twig on the ground last week and brought it home for closer inspection. I noticed some bud-like things near the leaf petioles. But they look like buds for next year's growth. Well that's where the buds for next year are growing on my tree, so I assume that's what these are. So that still leaves me with the question: where's the acorns? Show me the acorns! Mother nature could tell I was getting a little frustrated and she took pity on me by putting another oak twig in my path. This one was longer and had more growth. 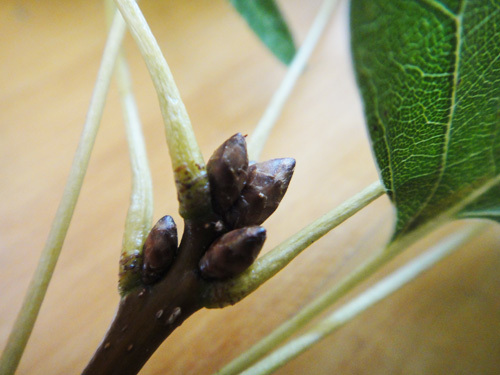 Now I was able to see two different kinds of bud-like thingies on the twig! See?! 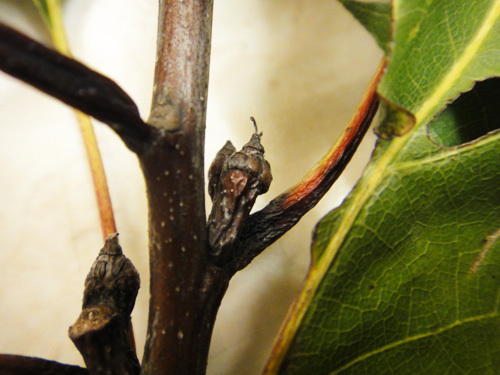 I think the top ones at the tip of the twig are the buds for next year like I saw on the first branch. And I think the darker ones below are tiny acorns! They just look different from the buds near the top. These things look like tiny shriveled peppers with mini acorn caps on them. 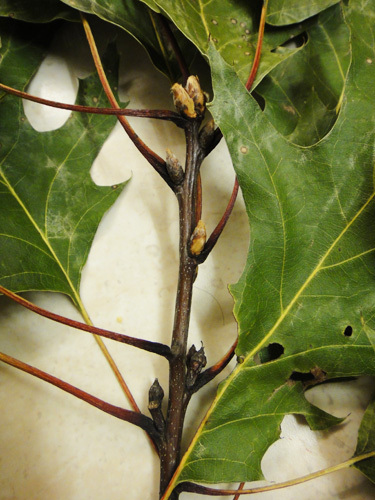 The other buds look more like something that could unfold its many layers to make flowers or leaves. How cool is that? Also, how neat are all the veins you can see in the close-up of those leaves?! Alright oaks, keep up the good work. I want to see more! This page contains a single entry by Alison published on October 14, 2011 6:04 PM. going, going.... was the previous entry in this blog. tree ring circus is the next entry in this blog.